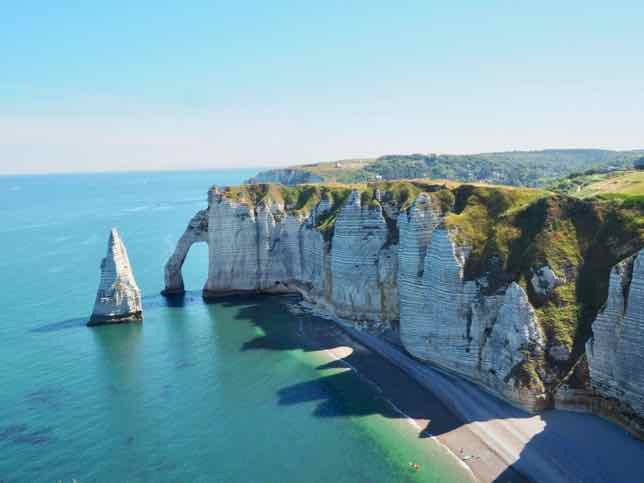 To get some spectacular photos of the famous falaises d’Étretat here are two of the best ways to see the cliffs at Étretat: by hiking and by speed boat. This place is truly a photographer’s dream and I actually don’t think you can take a bad photo. For years I had seen pictures of the famous Falaises d’Étretat and thought I’d like to visit one day. That one day came back in July recently and because I was staying in the town for a week, I had the opportunity to gaze at them almost every day. They are just that striking. When friends ask me about these cliffs at Étretat, I tell them it’s like the “white cliffs of Dover” in England—-white chalk cliffs taking a pounding from the cold waters of the English Channel. Étretat is located in Normandy, about 200 kilometres or 2.5 hours west of Paris. 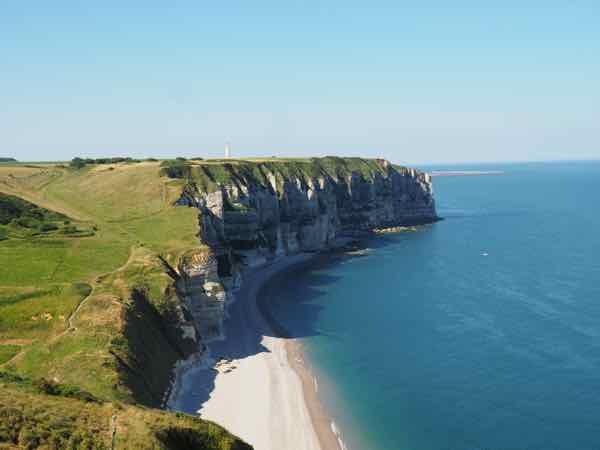 While many think of the D-Day beaches when they think of Normandy, Étretat and the the alabaster stone cliffs—Côte d’Albâtre (Alabaster coast)—-are located more in the northeastern section of the region, north of Honfleur. Where Are The Falaises At Étretat? 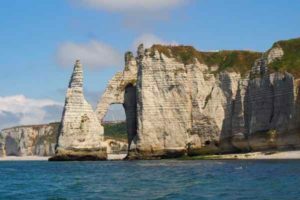 The two key falaises in Normandy which provide excellent views are located on either side of the town and there are three portes (arches)in Etretat that are associated with them. 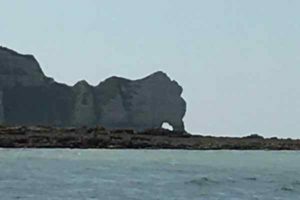 It is located just south of Étretat and there is a 70 metre high Aiguille, a rock that is jutting out of the water like a needle. But the real attractions are two natural arches: the Porte d’Aval (40 metres high) and the Manneporte (50 metres high). The falaise d’Amont is located just north of Étretat and on top is the Chappelle Notre-Dame de la Garde and the arch is called Porte d’Amont. Famous French writer Guy de Maupassant lived in Étretat and wrote hundreds of short stories and novels including, “Une Vie”, where he describes an elephant’s trunk dipping in the English Channel in Étretat. There is some controversy as to which porte he was talking about. 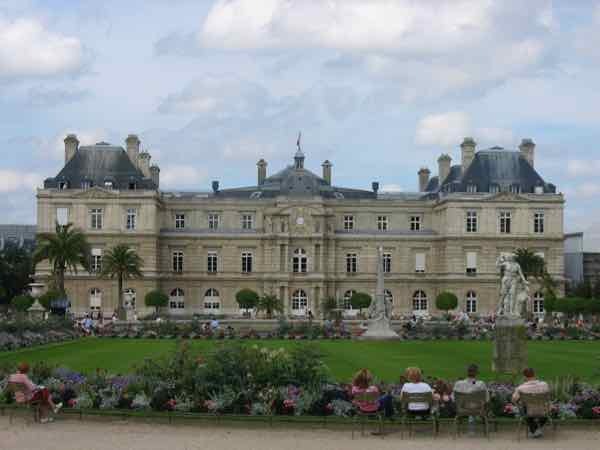 Many believe it was the Porte d’Amont not Porte d’Aval. Take a look. Which one looks more like an elephant’s trunk? I really think it’s Porte d’Aval. 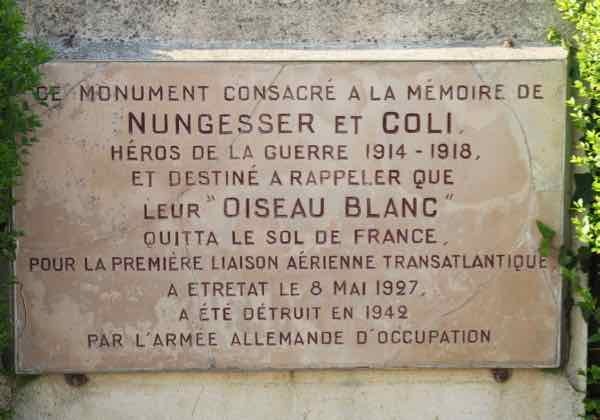 On top there is also a monument to French pilots Charles Nungesser and François Coli who attempted to make the first flight in their plane, “L’Oiseau Blanc” (White Bird) from Paris to New York City in 1927. Unfortunately, they never made it and it was in Étretat that they were last seen. Their bodies were never found. The original monument created in their honour was destroyed in 1942 by the Nazis. A new one was built in 1962. 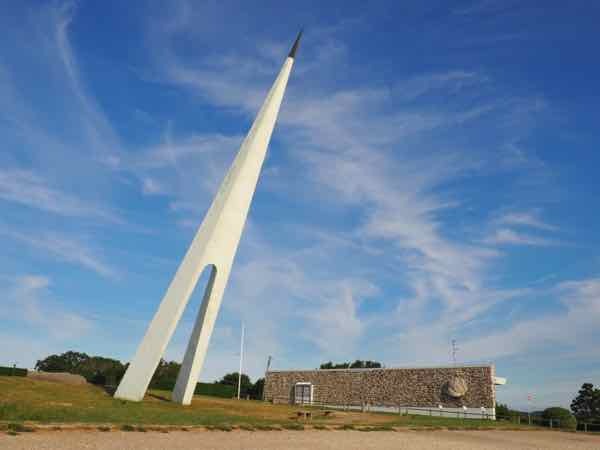 The Monument Nungesser et Coli is represented as a white arrow or spike that juts out of the earth pointing to America, where they were headed. Many French writers (ie. Guy de Maupassant, Victor Hugo, and Gustave Flaubert) and impressionist painters (ie. Claude Monet, Gustave Courbet, and Eugène-Louis Boudin) spent time working in Etretat. 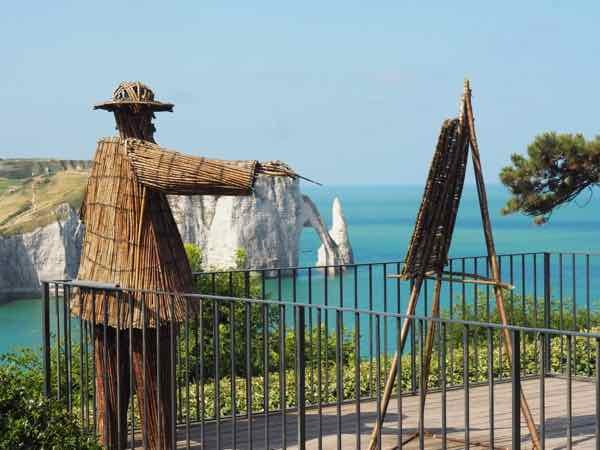 In Les Jardins d’Étretat, there is a tribute to Monet made out of twigs by Wiktor Szostalo. While sounding odd, it really is beautifully done. 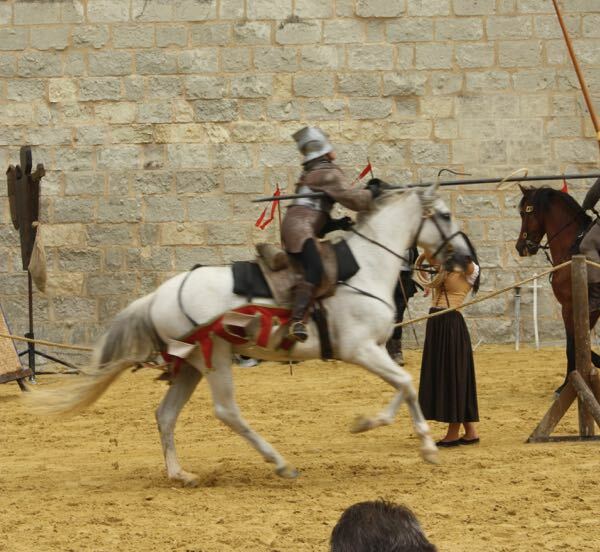 To see the Falaise d’Aval, you cannot drive there. You can only walk. One could walk up from the town’s main beach. A much more interesting route, however, is to take the relatively flat path that goes around the golf course. 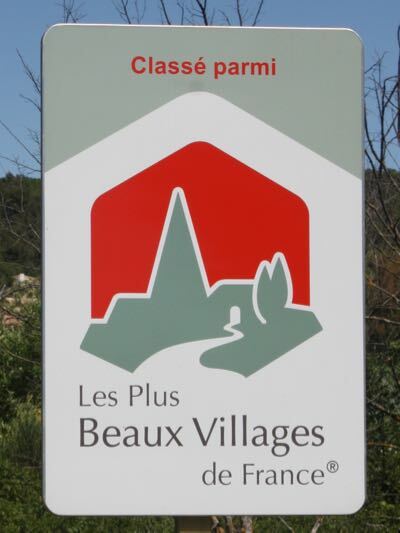 It starts just off the D940 road (near Avenue George V and Rue de Traz Perier) and the path (Chemin Petit Valaine) first takes you through some fields, by the golf course, and then along the coast (Chemin des Douaniers = coastal path). I left at about 10 am on a Sunday and there was hardly anyone out. As I got closer to the Porte d’Aval more people appeared. I have a feeling most people just walk up from the boardwalk. They don’t do the whole circuit which is a shame because they’re missing out on some wonderful scenery. The trek really doesn’t take that long, perhaps only 2 hours (at a leisurely pace, stopping for photos). 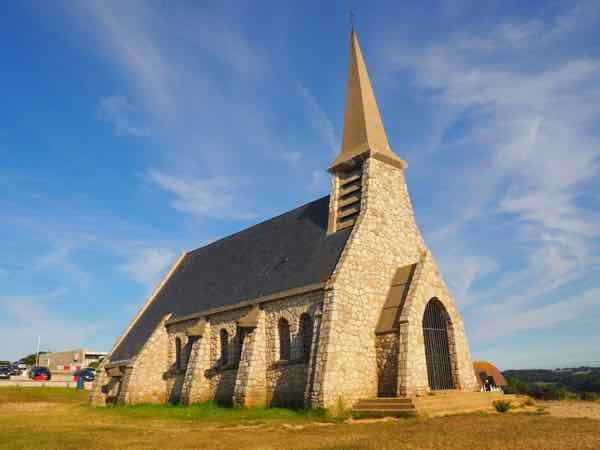 If you take this route you will see Manneporte, Porte d’Aval, and have excellent views of the Falaise d’Amont and the Chapelle Notre-Dame de la Garde. From the beach at Étretat, you can walk up the (341) stairs to the top of this chalk cliff. It really isn’t that bad. You can also drive up (Avenue Damilaville) there as there is a parking space by the Monument “L’Oiseau Blanc”. 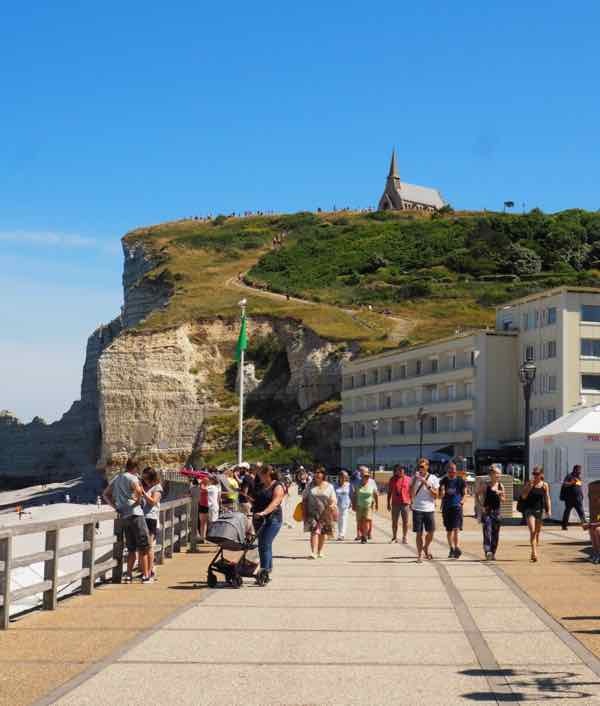 From up top, you will get superb views of Ponte d’Aval and the town of Étretat. 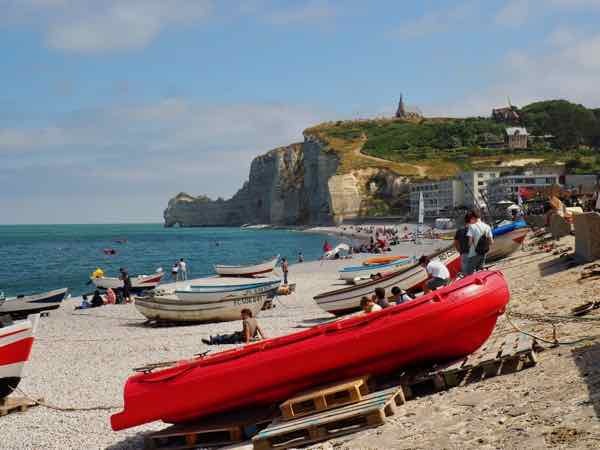 I went to the Étretat tourist office to enquire about boat tours and they recommended “Le Mer Pour Tous” which starts in Fecamp, travels south along the coast, and then returns to Fecamp. The drive to this town was only 16 kilometres, so it wasn’t out of the way. This is one of the best ways to see the cliffs at Etretat because you are at sea level. I will be honest and say I really debated up until about an hour before as to whether I really “needed” to take the 2 hour tour (33 Euros). I felt I had already gotten some fabulous photos of the cliffs. But I was wrong. The boat tour provided me with different perspectives and a thrilling ride. Not quite like an amusement park roller coaster ride, but close. Fortunately, the waters were calm that day and I did not get sea sick. I was advised that if I did, I was to raise my hand and ask for a bag. No throwing up in the boat or into the sea. Our tour guide, Jerome was great. He provided commentary in French and some English and provided the English speakers with a handout in English that had more information. We were provided with life jackets and I was happy I sat near the back as the front section of the boat did not obstruct my view. While one of the best ways to see the cliffs at Étretat is by hiking along the cliffs, keep in mind that there are no barriers. Be very careful getting close to the edge to get that great photo. 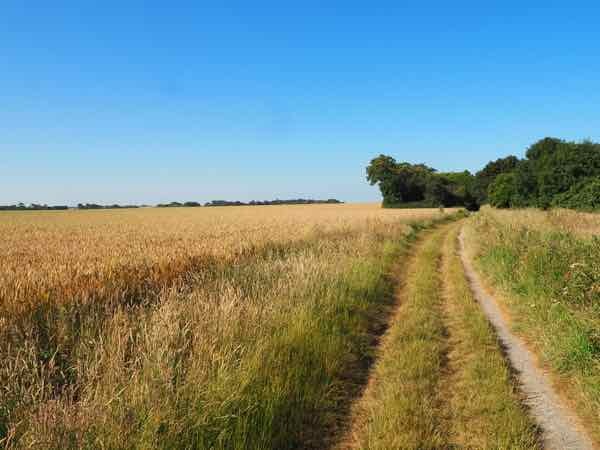 There are a few sections on the path where there are viewpoints with barriers. If you’re bringing children, hold onto their hands. I believe over 50 people have died because they walked under the arches and got caught in the tide that quickly came in. 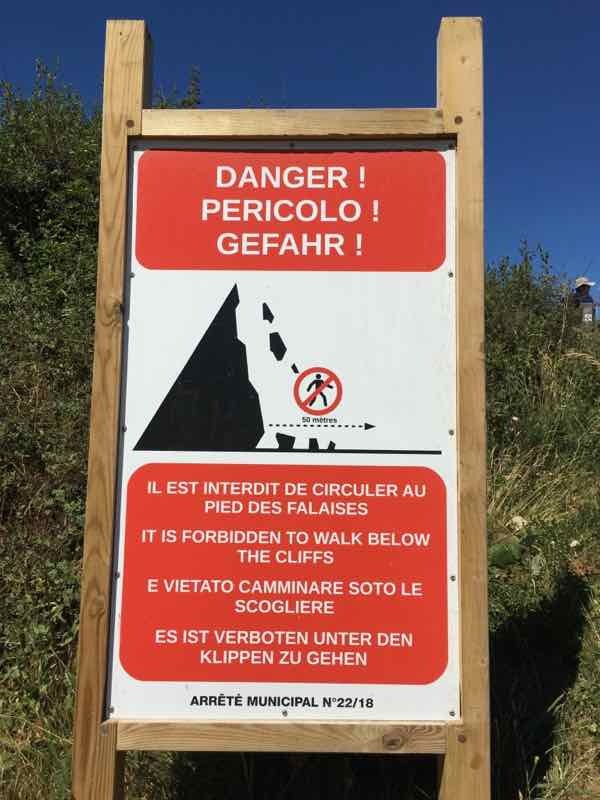 Visitors are warned not to walk under the falaises. I saw a number and some who had decided to take their kayak ashore. But I would not take the chance. The water levels change very quickly. My wife and I were in Normandy a few years ago but didn’t get further north than Honfleur. Shame on us, we missed these beautiful cliffs. We’ll have to go again another time. Thanks for the tip! That was my situation too. I never explored the eastern part, only the area around the D-Day beaches. So glad I went here. It’s my new favourite place! 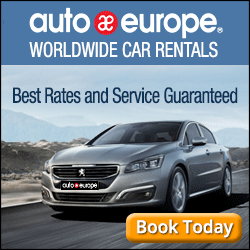 There’s never enough time to see everything in France. You just keep highlighting places that we need to go back and visit. 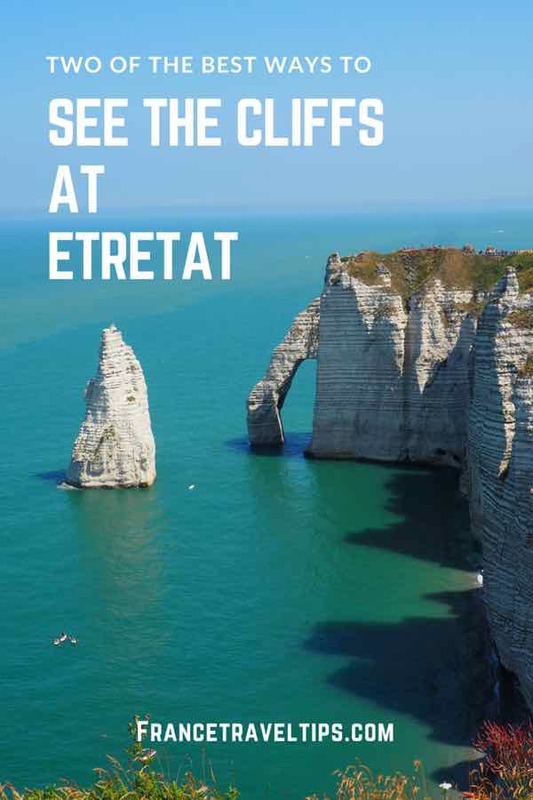 Thanks for bringing Ètretat to our attention. 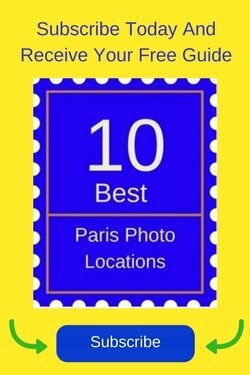 We’ll add it to our must-see places in France. 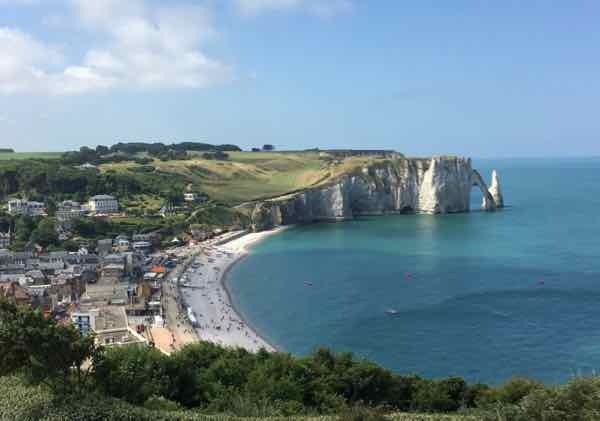 My list of new places to see keeps getting longer and longer, but Etretat is certainly one of my favourites! 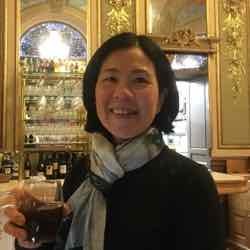 Thanks for sharing your inspiring journeys. France has so much beauty!